All of us have heard the tale of Little Red Riding Hood, the famous fairytale about the girl in the red cloak that visits her grandma in the woods only to find the big bad wolf ate grandma and plans on eating her as well. Yes yes, we all know this story. In the version our parents told us the huntsman comes and saves the day, killing the wolf and saving Grandma and Little Red. A happy ending. But that is the newer version of a fairy tale that has been retold many many times. Of course you can’t tell a child the original version, “…then the big bad wolf eats grandma and little red. They DIE horrible deaths and the wolf wins. HORRIBLE DEATHS! The end… Sweet dreams sweetie!” You tell a kid that and they’ll be laying in bed all night, horrified and wide-eyed clutching their blanket tight. But we aren’t kids anymore, so how about we go back to the beginning? 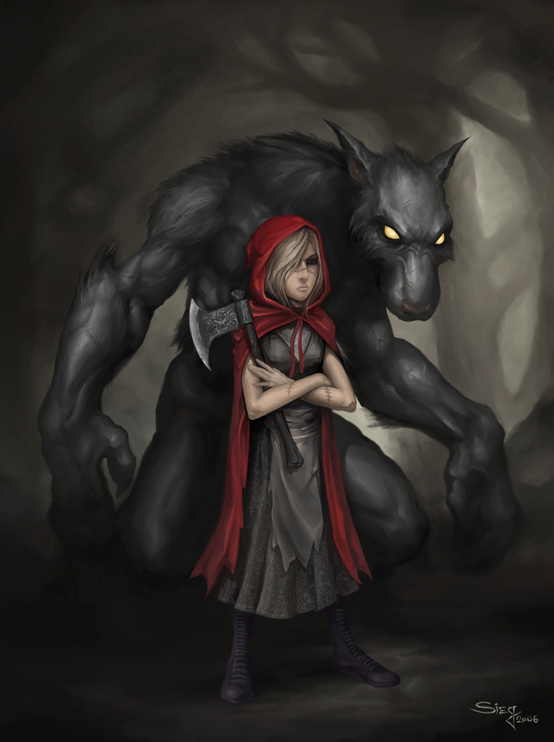 Little Red Riding Hood is an old story that has been told many times by many people, meaning that there are a handful of different versions of it. In the newer version the huntsman saves the day, in another it’s Little Red that stops the wolf by slicing open his belly and stuffing it with rocks and sewing him back up. You have some that say Red walks through the forest and straight to Grandma’s, while in others Red is told by her mother not to stray from the path in the woods, but the big bad wolf comes along to tempt Red into the woods. Folklorists and even psychologists have picked this story apart, peeling back the layers and looking at each version of this age-old story in attempt to find all the hidden meanings and morals. Why is it Little Red and not Little Blue? Why did she stray from the path? Why did she put rocks in the wolf’s stomach? In one of the oldest versions of the tale Little Red isn’t red at all, the color red was brought on later to mix in some hidden morals. Red is traditionally the color of sin, of lust and having the girl in the story wearing red is a representation of those naughty things. Some versions of Little Red Riding Hood are loaded with sexuality. One tells of a girl who performs a strip tease for the wolf’s benefit and then asks the wolf questions about the wolf’s own body parts. A similar version also involves stripping, saying that the girl is offering the wolf one article of clothing after another in attempt to buy her freedom. Her plan doesn’t work and the wolf kills and eats her, leaving nothing behind but her arms. The moral behind this story was that selling yourself is wrong and you will be punished for it. Clearly it was directed at whores and prostitution. Back in the day they were big on turning a tale into a story about good versus bad morals. Then you have the version where Red is told to stay on the path, but she doesn’t listen and is tempted away by the wolf. Psychoanalysts say that Red leaving the safe path and following the wolf into the wild wood shows us that Red is no longer a child. She has claimed independence and is free to make her own choices in life, and her own mistakes. One version has the huntsman come in, kill the wolf, cut open its belly and pull out the grandma who in spite of being swallowed is still alive and now well again. This shows that even though we go through horrible and torturous events in our life, we can pull through and come out alive and intact. Then you have the story where Red cuts open the wolf’s belly, stuffs rocks inside and sews him back up. The wolf, still alive, tries to run away to the forest but the rocks weigh him down and break his heart, which kills him. The idea behind this one is that the rocks symbolize the weight of the girl’s experience that she has earned. She has learned a hard lesson and won’t be fooled again. Believe it or not this is only a small look into this fairytale. There are dozens and dozens of Little Red Riding Hood stories from all over the world. Each country and each point in history has its own version with its own meanings and moral codes. Weird Werewolf Wonders: Nine Things You Have to Buy!